In Pakistan arrival of Spring/Summer is all about the #LawnCollections, this craze is unstoppable. More designers and brands endorsing #LawnMania makes it even more unavoidable. 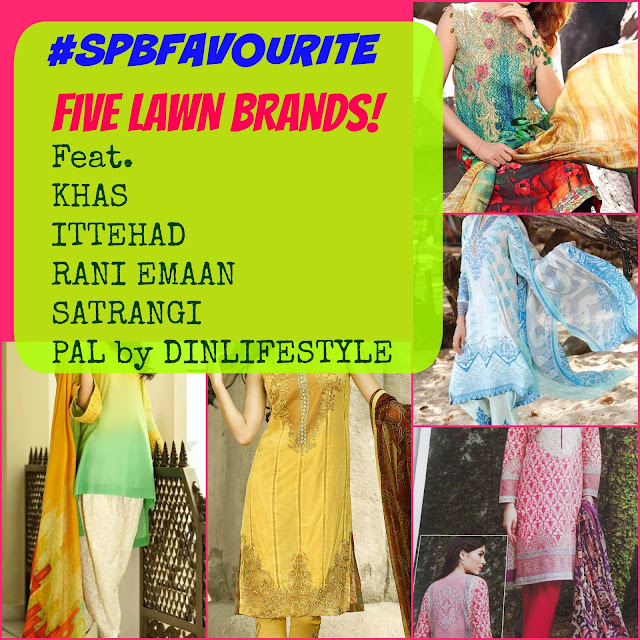 #SPB decided to rank 5 of its favourite Lawn brands of this season, based on personal experience. Keeping the 7-8 months long Summer and the craze in mind, Lawn has to be Pakistan's most favourite fabric. Every year , every woman has a list of to-be-purchased brands of Designer-Lawn. #SPB is not different at all, there are few brands which tops our list of Lawn shopping. Luckily this time we got to try some new brands in Lawn Industry, few even with their first ever Lawn collections. So this post for #SPBFavourite Five Lawn brands is compiled on personal experience with the Lawn brands, to give you an honest review and to help you shop your favourites. Note: We personally do not like replicas, and even don't endorse them, as genuine stuff may be expensive but the quality pays off. After venturing and succeeding in Home decor and accessories, KHAS stores launched the brand's premium lawn this season. Khas premium Lawn has a variety of designs and colours palette, which suites all ages and every pocket. The price of suites ranges from Pkr 2200/- (Lawn dopatta), Pkr 3200/- to 4500/- (Chiffon dopatta) and Pkr 6100/- (Silk dopatta). With its complete range of Daily wear to luxury Lawn it has to be our most favourite Lawn Brand this season. The Lawn is soft, comfortable, light yet not see through. Khas Premium Lawn has 3-4 pcs suites, with neck embroidery and embellishments etc. The Chiffon and Silk dopattas are pure and of really fine quality. The best part is the colours you see in the catalogues are the exact colours you get. As we loved the collection so well, we couldn't help but pick three from the range, another one is reviewed HERE. Visit Khas store's website. Luxury, is what one expect when both big names in fashion and textile industries joins hands. Lawn connoisseurs ranked this collection to be the best and we agree. Ittehad Lawn designed by Nilofer Shahid is pure luxury all in all, from colour palette to designs, prints and embroidered embellishment. #SPB is lucky to gets its hand on one of the best piece from the collection, rightly named Basant, priced Pkr 5950/-, before it went out of stock. The stuff is soft and comfy, light colours may not make it that opaque (ykwim?). The pure luxury element in this suite is the digital print Silk Dopatta, depicting a painting of Old Lahore's skyline. The embroidered Trouser is really fancy. It has 2 neckline (front and back) and 2 sleeve embroidery pieces to be appliqued. Detailed review of this suite is published HERE. Visit House of Ittehad's website. Rani Emaan's has an established name in the fashion industry and its fisrt S/S Lawn collection had many people waiting (recalling the grand launch, details HERE). Rani Emaan's collection is pure luxury lawn, with pure chiffon dopattas and embroidered necklines and trouser/daman embellishments, best for Formal wear. This is one of the most rich collections of the season. We are not disappointed in here as well, the stuff is soft and comfy, with all the embroidered pieces appliqued on it, this will be a perfect Formal wear for dinners and parties this Summer. We got our hands on Marigold, Pkr 6200/-. Visit Rani Emaan's website. 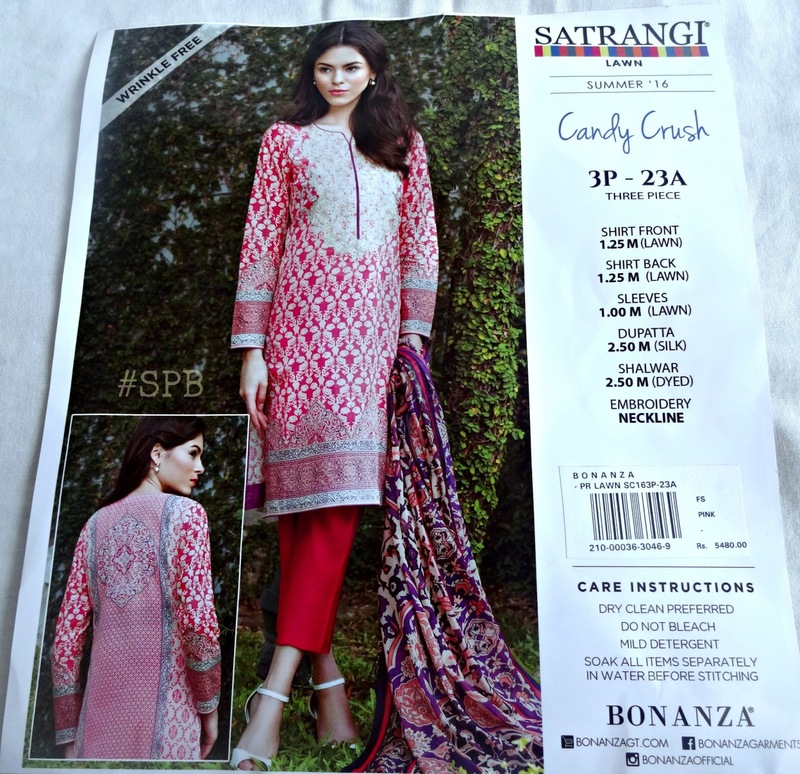 Satrangi Lawn is one of our every season must-haves. #SPB is already a fan of this brand regarding its fabrics and wearable prints. Along with pret, Satrangi is bringing the best designs in unstitched lawn range, every year. We got Candy Crush, a 3 pcs with a golden embroidered neckline, giving it a formal look. Best for Summer Eid! Stuff is soft and airy, yet not see through. Silk dopatta is fine. Pkr 5480/-. Visit Bonanza website. Din Lifetyle has two ranges of affordable lawns, Pal and Silveen. Silveen suites provides the soft fabric, along with chiffon/lawn dopatta plus embroidered embellishments in Pkr 2250/-. The Pal Lawn is a bit refined with added embellishments and fine chiffon dopattas only for Pkr 2450/-, so Pal Lawn makes it to our top 5 due to its highly affordable price range. We like the soft stuff, but the colours in the catalogue are not as bright in real, but we can overlook this fact given the price and affordability. Embroidered neckline, printed trouser, lace for sleeves and a fine chiffon dopattas is all you get in Pkr 2450/-. This may not be a luxury lawn for formal wear, but this will make you survive any morning trip in hot! hot! Summer. We picked Azure Fantasy. Visit Din Lifestyle website. This is not all, with the latest Volumes coming and Eid collections pouring in, we are looking forward to try out some more, as "Abhi tou party shuru hui hey!". So our Summer party topped with our #LawnCraze has just started! Till then you check out all our posts on Lawn, HERE and give us your feedback. Follow #SPB & #LawnMania on Instagram, Facebook and Twitter. Note: We'd like to personally thank the brands and the PR persons/agencies for their kind assistance. These are some gorgeous picks. Satrangi and Ittehad have some really good designs.